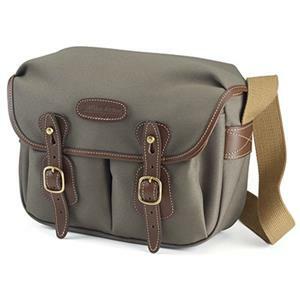 The Billingham Hadley Small Photo Bag in Sage FibreNyte Chocolate Leather trim carries on the excellent tradition of bag making and is a very high quality product. It has a fully removable insert, which makes the bag versitile, as it can be used as an overnight bag as well as a camera bag, but is well padded for carrying expensive camera gear. The darted main flap locks into place with two adjustable quick release straps which have attractive brass buckles. The fully adjustable shoulder strap is firmly stitched into place and then has a further leather patch to ensure absolute security. SuperFlex inserts keep cameras and lenses protected and separated from each other. The Quick Release System allows ease when opening and closing regularly.